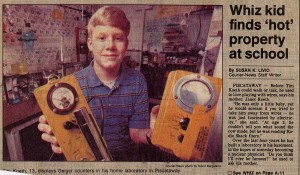 My fascination for radioactivity started very early, at the age of 10 I knew I needed a Geiger counter. I searched high and low for one, calling my science teachers and their friends, but to no avail. 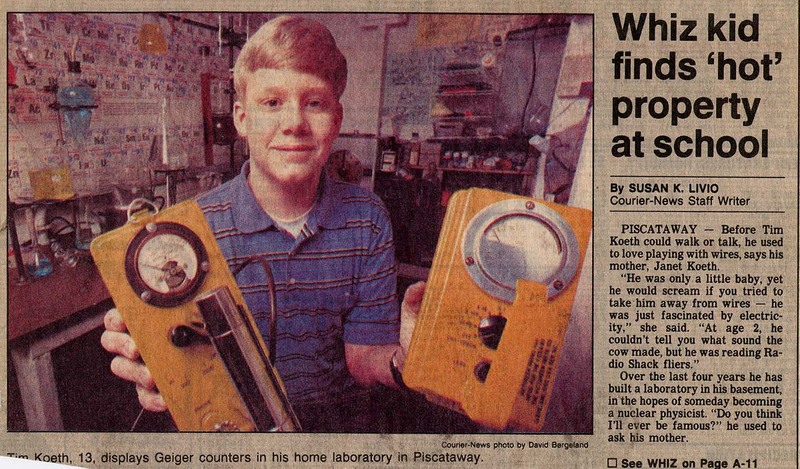 It wasn’t until 8th grade, at the age of 13, having transferred to Alma Preparatory School in Zarephath NJ, did my long search come to an end with old civil defense Geiger counter placed into my hands. It was a CDV-700 made by Victoreen stored away in a box locked in a cabinet for forty years. I talked Mr. Cruver, my science teacher, into letting me take it home. That was it ! It never left my side. I surveyed everything. I’d go for walks around my neighborhood looking for something, anything. I found a few radium painted clocks and smoke detectors, but not much more. The afternoon of Thursday February 1st, my radiological hunting advanced to big game. That afternoon, I visited my former grade school where my aunt was teaching, and while waiting for her, my cousin and I scouted about the school with the trusty CDV-700. I still can remember the faint buzz of the high voltage oscillator bleeding through to the audio circuit, being interrupted every so often by the click of a cosmic particle or some stray background radiation. As we walked down the corridor the frequency of clicks increased, it didn’t take long to realize there was a source nearby. We poked into different rooms and halls mapping out the field rates. Finally, we pinpointed the source location to be in what was known as the “old science closet.” Unfortunately, due to the lateness of the day, anyone who had the key for the room had gone for the day. One week later, Thursday – February 8th, I returned to the school having made arrangements with the science teacher right to inspected the closest. He unlocked the door and I stepped in. The field inside the room pegged the CDV700; piece by piece, objects had to be removed from the room in a processes of elimination to determine the source of this fantastic radiation. 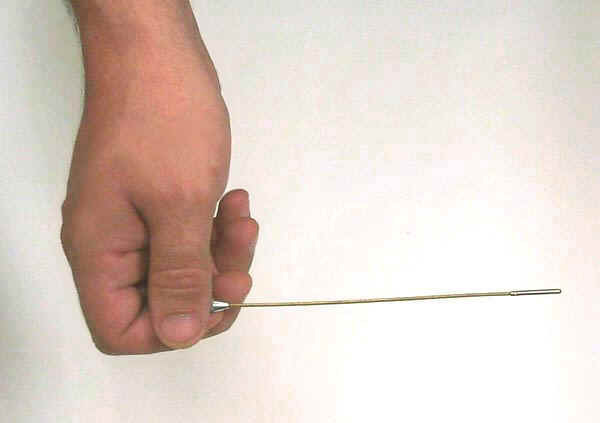 It was just a little metal rod with an obvious handle at one end and a tip at the other. Seeing as my CDV-700′s maximum scale was 50 mr/hr, I held the source by the handle and away from my body. Honestly, thinking the source was not that bad, only being marked “Radium Chemical Company,” I took it home. A few minutes later I arrived home (my mom was driving), coincidentally my father pulled into the driveway from his day at work. Being the proud hunter, I had to display my kill to him. Dad wasn’t very thrilled, but he trusted me. I took the source down to my lab, which had been converted from my father’s old darkroom. I was curious to see if I could make the needle of my CDV-720 Ion Chamber deflect the slightest since I was never able to with any test sources of mine. I turned the unit on to the most sensitive setting(0-5 R/hr), and to my jaw dropping awe I saw the needle peg out on the 5 R/hr scale. Next, I set the Ion Chamber to the 50 R/hr scale and noted that the field of the device near the tip leveled off at 50R/hr. ” OH MY ! What have I done” were my precise thoughts. I knew a lot, but not enough. I had not known about the inverse square spreading law, and I thought that I had given myself a near fatal dose of radiation. He actually took it pretty well. He called the local authorities first – they were useless, then he called the NJ Dept of Health – they were even more useless, for they thought my dad was cranking them when he told them the dose readings that I had found. My dad gave up and waited till the next day to call around some more. Meanwhile, I took the source and, using pliers, bent the rod, near the tip, to decrease the linear length of the device. Then placed it into a 1 liter Nalgene jar that was completely filled with cement with the exception of a small tube along the central axis of the container. I placed the cap on the jar, and then placed the jar in a 33 gallon drum of similar description. Except the drum had a 4 inch PVC pipe down the center, and the rest was also filled with concrete. I had made these for fun, never with the intention to use them, but they were quite handy for shielding. They greatly reduced the field of the source, but not to background. With the source shielded as best as I could, I called it a night ! I went to school as usual, worrying all day about my exposure. I kept tugging on my hair to see if it was starting to fall out. I pulled so hard I think it began to come out. My mom picked my up from school at 2:50 that afternoon, and I immediately asked about dad and if he was able to contact anyone. She laughed, laughed just that certain way; “uh oh” as my throat sank into my gut. She said that several official were already at the house and mentioned that they were going to need to take our house away in 55 gallon drums because it was heavily contaminated. Oh no, oh no! She continued to say that the task force was on their way to our house as we were also on our way home. You must understand that my mom has seen one too many movies, and likes to be dramatic. But this time, she was not embellishing; sure enough, the task force was on their way over. About ten DEP and EPA Health Physicists were enter the house before that long evening was over. As I arrived home from school that Friday afternoon, I was greeted by a health Physicist who proceeded to ask me many questions over and over and over at the kitchen table. Meanwhile a small group of Health Physicists were gather in my garage where the 30 gallon drum had been wheeled. It was a rainy and dismal day. I remember wanting to see what was going on in the garage so badly, that finally the Health Physicist interviewing me let me watch from a great distance (in an attempt to keep my dose where it was). After wrapping the drum several times with thick lead sheet, they were ready to pull the source out. A couple of technicians from Teledyne Isotopes arrived with a van containing a drum lined with depleted Uranium – very dense material, great for shielding. They backed the drum up to the garage and transferred the source to their superior container. Returning to the kitchen table I faced lots of questions from lots of people. At one point one of the health physicists came up from the basement with an astonished look on his face. “Why he has….” and proceeded to list most of my surplus scientific equipment that I had gathered in my lab. After more questions, and recreating the trip home with the source to the point of where I sealed it in the drum in the back yard, the team of health Health Physicists estimated my dose to be 275 millirem, about one years dose for an average member of the public. Substantially less than what I thought that I had given myself. As the Teledyne technicians drove away all the needles on all the meters fell to zero, there was no contamination. All the material was contained in the tip. This I am very lucky of. As Radium decays it emits alpha particles which are just energetic Helium nuclei. After a few interactions, the alpha particles lose their energy, then they pick up free electrons (from the metal case, etc) and form Helium gas. This gas builds up in the tip and wants to release. The pressure on the case coupled with the case’s radiation damage of 60 years of direct exposure, it is not uncommon for these caps just to pop open and spread their material all over. This would have been extremely bad ! I am so thankful that this did not happen. The spray paint markings on our garage floor where the Health Physicists took measurements in order to determine the amount of activity that was in the tip persisted for years. The estimated amount was found to be 100 millicuries of Ra-226. In the 1920′s that was worth 11,300 dollars. ($113/mgrm of radium). This also confirmed my readings of 50 R/hr.